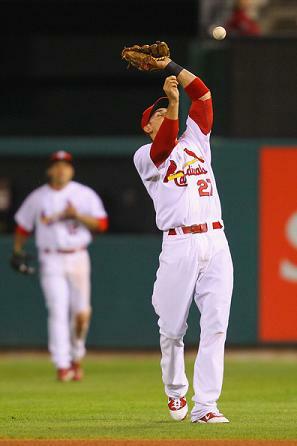 And so ends the tenure of one of the most polemical Cardinals players in recent memory. That incredibly loud cheer you heard erupt around St. Louis this afternoon? That wasn’t Busch Stadium going nuts for the Cardinals winning; rather, that was the reaction to the news that the St. Louis Cardinals had traded middle infielder Tyler Greene to the Houston Astros for either a player to be named later or cash considerations. The Cardinals have had a lot of whipping boys that fans have enjoyed ripping online. Rarely, however, have I seen such unified disdain for a Cardinal as I saw for Tyler Greene. Taken 30th overall in the 2005 Rule 4 draft, Greene was a high-average, power-hitting shortstop prospect from Georgia Tech with excellent speed (his junior year he stole 31 bases and was caught just once), giving the Cardinals hope that perhaps they’d landed a starting shortstop for the next decade, much as Boston had done a decade earlier with another Georgia Tech shorstop, Nomar Garciaparra. Weeeeelllllllll, that didn’t exactly turn out as expected. Greene never really got the chance to start at shortstop. 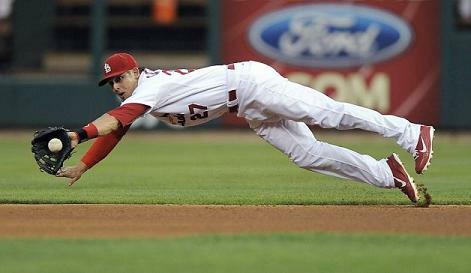 In 2009-10, the Cardinals had perhaps the best fielding shortstop in the majors, Brendan Ryan. When he left last year, the Cardinals brought in Ryan Theriot; when that didn’t work out, the Cardinals brought in Rafael Furcal and re-signed him to a two-year contract this off-season. Greene’s lack of development as a starter combined with his inconsistent performance when he did play led to the inevitable. In four seasons, Greene amassed a slashline of just .218/.295/.329 and hit just nine home runs and drove in 47 runs in just 556 plate appearances. His defense was so mediocre that even when the Cardinals were forced to rest Rafael Furcal for a few games, they put natural second baseman Daniel Descalso at short and converted outfielder Skip Schumaker at second, leaving Tyler to back up Skip at second instead of Daniel at short. I’ll be the first to admit, at the beginning of the season, I was rooting hard for Tyler to take the spot at second. As the season’s worn on, though, it’s become pretty evident that his future would not be in St. Louis. I wouldn’t be surprised, though, if he becomes an above-average utility infielder. Greene isn’t a complete waste of space, contrary to the opinions of some fans. As a major leaguer, he stole 25 bases and was caught just twice, both when he’s been on third base. He has been picked off first base once, but he’s never been caught going from first to second or second to third. When Greene started and batted in the eighth spot in the lineup, he actually posted respectable numbers this year: .270/.329/.527, well above the league average of .241/.307/.363. For his career from that spot, he’s slashing .250/.328/.402. The thing is, these are decent numbers for a number 8 hitter; when you’re a first-round draft pick, however, you’re not expected to be hitting in the 8th hole. And so now Greene heads down to Houston, where he reunites with fellow former Cardinals first-round pick Brett Wallace as well as pitcher Chuckie Fick and the man responsible for drafting the three of them, Jeff Luhnow. Luhnow took over as the Astros GM this past off-season, but before that was the Vice President of Scouting and Player Development for the Cardinals. If you’re still not familiar with that name, think of it this way. Luhnow had just about as much to do with the players on the roster this year as GM John Mozeliak. The Cardinals’ minor league teams have won five league championships in his tenure, and in 2011 the Cardinals organization was named the organization of the year by Baseball America. Pretty impressive. So for now, we say adieu to Tyler Greene, an enigma of exciting promise and lead hands. Greene will likely fill in as a utility man once again down in Houston this year, as the Astros have All-Star Jose Altuve at second base and Jed Lowrie, who has 14 home runs and an OPS of around .800, at shortstop. To replace Tyler Greene, shortstop prospect Ryan Jackson has been added to the 40-man roster and promoted to the Cardinals. Jackson, 24, was a 5th round pick out of Miami in 2009 whose glove is considered his greatest asset, although he did have ten home runs this year and 11 last year.